Mahilyow Airport (Belarusian: Аэрапорт Магілёў, Russian: Аэропорт Могилёв) (IATA: MVQ, ICAO: UMOO) is an airport that serves Mogilev, Belarus. 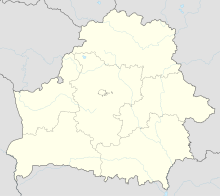 This article about transport in Belarus is a stub. You can help Wikipedia by expanding it. This page was last edited on 7 February 2019, at 08:48 (UTC).